Alex Collier was live via video stream on November 4, 2016. 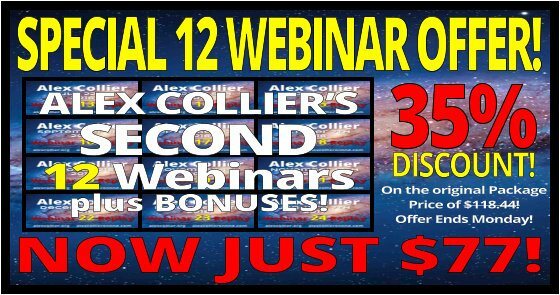 His twentieth 72 minute LIVE webinar including more than twenty minutes of quickfire questions and answers. Hosted by James Harkin from AlexCollier.org and JayPee from WolfSpirit.tv (a subsidiary of WolfSpiritRadio.com) Alex presented some great insight into what is happening in this world and beyond. The webinar was hosted on Friday November 4, 2016 at 2pm EDT. 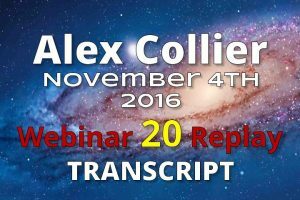 Alex Collier discusses many topics in this webinar including: Watching and observing the falling away of the reptilian paradigm and embracing a future we have direct intention in creating.